Take an exciting air tour from Guatemala City to discover the beauty and ancient history of the Mayan ruins of Tikal! After a scenic flight to Tikal, spend a day in the UNESCO World Heritage-listed Tikal National Park exploring the incredible archaeological site of Tikal, located in the heart of the Guatemalan jungle. Your expert guide will show you around the impressive ruins and teach you all about the history behind the steep-sided temples and plazas. See one of Guatemala's most beautiful ruins in an easy and convenient way! Enjoy a scenic flight from Guatemala City to the Mayan ruins of Tikal on this exciting day trip! 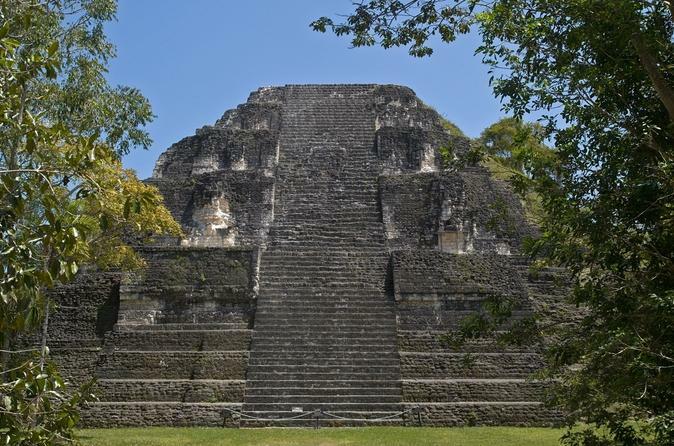 Visit the incredible archeological site of Tikal, located in the Guatemalan jungle, and experience the history, culture, beauty and nature of Guatemala. After pickup from your Guatemala City hotel in the morning, head to airport, hop on a small plane, and set off toward the town of Flores in northern Guatemala! When you arrive, you'll be driven to the UNESCO World Heritage-listed Tikal National Park (Parque Nacional Tikal). With an area of more than 341 square miles (550 sq km), this national park is home to thousands of separate ruin structures scattered around, each full of intriguing history. Follow your expert guide through these Mayan ruins and visit the Central Acropolis, a maze of courtyards and small temples, before continuing to Complex Q and R, where you'll see twin pyramid complexes with altars set in front of the temples. Visit the massive Temple I (also known as the Temple of the Grand Jaguar), built to honor and bury King Moon Double Comb. This 144-foot (44-meter) temple encloses three rooms with outside stairs leading to the top of the steep temple. Walk a short distance to the equally beautiful Temple II, the Temple of the Masks. After your tour, enjoy a delicious lunch before taking some time on your town to explore the ruins at your leisure. Then, head back to the Flores airport to begin your transfer back to Guatemala City.